My boyfriend and I bought a set of Emerilware about a year ago. It is the fist real cookware set that we've purchased, but we absolutely love it. It looks really nice and it cooks even better. We had been looking at more expensive sets, but read some reviews that spoke very highly of this set and decided to purchase this instead. My favorite piece is the 3 quart casserole with lid. 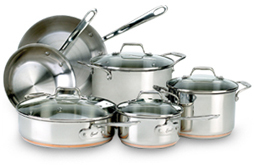 Unlike some cookware sets, the lids on this set fit very tightly, making it easy to make a casserole or rice. The fry pans are great, but like any other stainless steel cookware set, you need a lot of extra oil so things don't stick. (Don't even try to make an egg in them... you'll be sorry you did.) It is great for cooking chicken or other meat. It doesn't spatter oil and produces a really nice brown color. It also works great to get the pan juices up using wine. One other word of warning... if you use metal spatulas to chop (ground beef, etc) in the pan, it will dent the pan. I would absolutely purchase Emerilware again, although I don't think I will have to for a long time. We cook a lot and the pans still look brand new. I might consider purchasing the saucier pan next. Thanks for taking the time for writing your review.